DIY lets kids create portfolios of the stuff they make through a public web page. Friends and family members can encourage their work through stickers and parents can monitor their activity from a dashboard. “We’ve all seen how kids can be like little MacGyvers,” the company writes in an introductory blogpost. “They’re able to take anything apart, recycle what you’ve thrown away – or if they’re Caine, build their own cardboard arcade. This is play, but it’s also creativity and it’s a valuable skill. 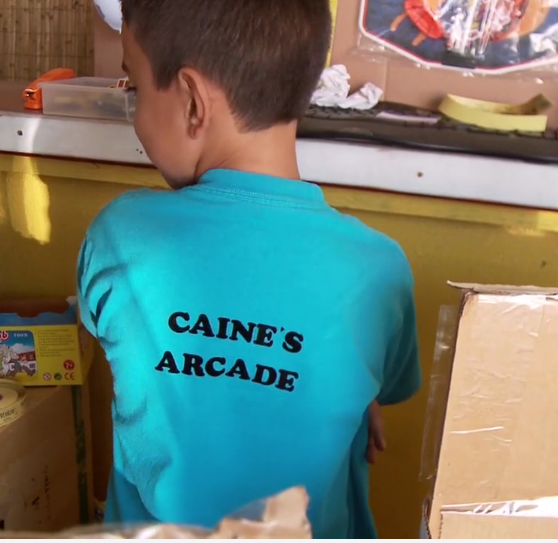 Caine is an inventive 9 year old who made himself an arcade. An arcade made out of taped together cardboard boxes. A functioning arcade with tokens, tickets, and prizes for winners (he reuses his old toys). Well, functioning in that he devised ways to make things work with a little help from him, as opposed to purely mechanical means. But the real beauty of his work is found in his systems thinking. Caine wanted someone to play at his arcade; he even went so far as to develop a cost structure. Very MBA of him. But seriously? Smarter. Here’s the cost breakdown: $1 for 4 turns. Or for $2 you can get a Fun Pass. How many turns do you get with a Fun Pass? 500. That’s right $2 gets you 500 turns. Now that is a good pricing strategy, and it’s a pretty stellar participation strategy, too. Oh, and he’s also figured out a way to reduce gaming of his Fun Pass system by using old calculators and the square roots of pin numbers. Amazing. It’s mostly all sunk costs for Caine—who by the way, is using primarily found materials—but money is not the motivating factor for Caine. He just wants you in the game. What if we approached badging like that? What if we asked ourselves, what’s the real goal we’re aiming for here? How can we transmit the magic we feel to others? How can we create a system that works to keep people in the game? And what are ways we can do it so that our participants feel rewarded in both mind and spirit? Caine accomplished this—most likely without being fully cognizant of it. Sure, on some level it’s silly. But so what? Because on another level, it’s lovely and transcendent. Caine revealed to us what’s possible when you forge ahead to create something out of joy and then work to share it with the world. For that I admire and respect him. I share this small but inspirational story with you because I dream (and I think it’s a big dream) that Mozilla Open Badges may prove to be someone’s arcade. The tool that allows them to beam out to the public the excitement and joy they feel when they share what they’ve created. I’m hoping Open Badges helps more people get in the game. This entry was posted in Badge System Design, OBI, Open Badges and tagged badge system design, creativity, design, dmlbadges, drumbeat, identity, inspiration, learning, mozilla, openbadges, privacy, software, system design on April 30, 2012 by carlacasilli.